Drivers never seem to doubt their ability to drive with little fuel left in the gas tank. People always think outside of common sense that there is a slight chance they might make it off the freeway to the gas station near their house. Most of the time when you’re driving in the red. You are going to run out of gas on the road. When this has happened to you then give us a call to make full use of our affordable fuel delivery service. Once you give us a call our phone operators will gather the required information about your vehicle and location then dispatch a roadside tech near you. Our service is fast and completely affordable so you don’t have to worry about making a dent on your finances. Running out of fuel can happen at any time, be it night or daylight hours. There are also vehicle issues such as a faulty fuel sensor which can make it very difficult to know when you need fuel! There are numerous reasons why you can run out of fuel, let alone forget. If you happen to have a gasoline shortage call us 24/7 for gasoline delivery service. 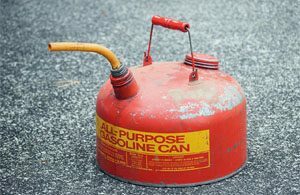 Our tow truck drivers and roadside assistance techs are all equipped with gasoline canisters. Once you call our dispatcher they will be deployed immediately to service your vehicle. Once you see how convenient our 24-hour fuel delivery service is you’ll make sure to save our number in your phone. Let us be your go-to towing and roadside assistance company in Los Angeles anytime you need us. We are here to take your call anytime you need a low-cost fuel delivery service in Canoga Park and surrounding areas.